President George W. Bush held Democrat John Kerry to just 53% of the Latino vote in 2004. But even if Republicans replicate Bush's performance in 2016, they'd have to maintain their 2012 margins with white voters to win. In the 2012 election, Democrats captured a historical 72% of the Hispanic vote, leading many pundits to speculate that Republicans could have a difficult time capturing the White House in 2016...or perhaps, ever again. 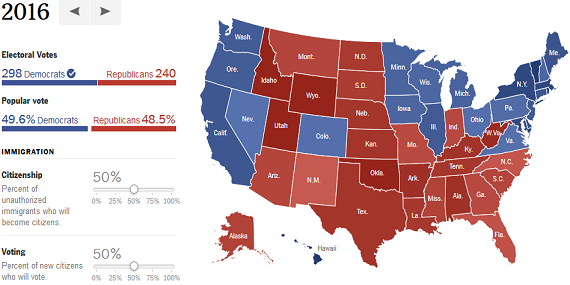 In light of the emerging debate surrounding the effect of immigration reform on Presidential election results, FiveThirtyEight's Nate Silver released an awesome interactive map yesterday that allows users to tamper with various demographic and voting distrubition scenarios to produce certain election results WELL into the future (2048, to be exact). And based on what I've seen from the map, it's pretty difficult to create a plausible scenario where the GOP would win in 2016, much less 2048. 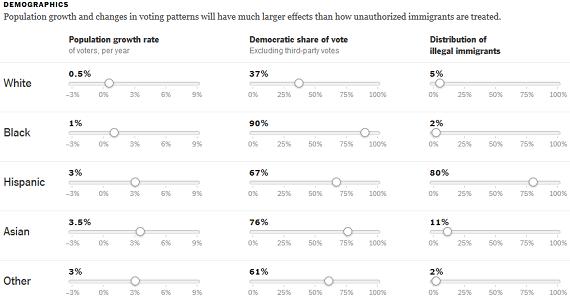 Off the bat, I'll note what Nate Silver pointed out in his article yesterday: "Population growth and changes in voting patterns will have much larger effects than how unauthorized immigrants are treated." As a result, I let most of Nate Silver's assumptions remain (which were all derived from a 2012 election baseline), tampering only with white, black, and Hispanic demographic vote distribution. Regarding the black vote: Democrats attracted between 83-90% support from African Americans in presidential elections from 1984-2004. But the election of one of their own in 2008 boosted those numbers to their now near-unanimous 95%. With another non-African-American Democrat running for President, it's possible to see the African American vote returning to pre-2008 levels of 90% or less for Democrats in 2016. Regarding the Hispanic vote: the 72% level of support from Hispanics obtained by Obama last November was a bit of an anomaly compared to past elections. Before 2012, no Democrat had ever done better than Bill Clinton's 71% level of support in 1996. In 2008, 68% of Hispanics supported Obama, while just 53% did so for Kerry in 2004. 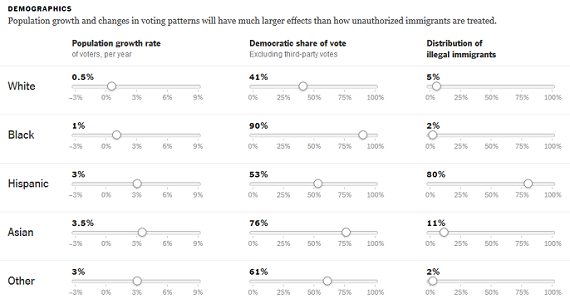 If Republicans get on board with immigration reform, they could receive a bump strong enough to return them to '08 levels of support among Hispanics; hence, the Democrats 67% vote share in 2016. Regarding the white vote: of all the vote distribution changes I made to Silver's map, this is the hardest to justify. In 2012, Republicans were able to hold Democrats to their lowest margin among whites since 1984, when Walter Mondale only captured 35% in an electoral rut against Ronald Reagan. Since then, no Democrat has obtained less than the 39% of whites won by Obama last November. For the Republicans to hold Democrats to 37%, as the above scenario does, they'd have to be running against a pretty weak candidate. In this scenario, the Democratic vote share among whites rises from 39% in 2012 to 41% in 2016, while the black vote remains at pre-2008 levels (90%), and the Hispanic share drops down to 53% (2004 levels). One could envision a scenario such as this in the event the GOP nominates Marco Rubio, Susana Martinez, or another viable Latino. While the GOP's share of the white vote may decrease from 2012 as a result, the possibility for inroads among Hispanics is undeniable. Consider the fact that in 2000, Al Gore managed an impressive 67% among Hispanics. Four years later, Kerry's 53% looked poor in comparison. Four years after that, Hispanics were back to voting 68% for the Democrat. If, say, Marco Rubio holds Democratic support among whites at 41% and blacks at 90%, but wins George W. Bush-like levels of support among Latinos, the Republicans would still narrowly lose the 2016 election, 50-49%. And that's even assuming that a lot of things go RIGHT for the GOP (white support doesn't level off much, BIG increase in Hispanic support). Unfortunately for Republicans, the first two scenarios above require a bit of a stretch of the imagination to wrap your mind around. The final scenario, where Democrats win big, is not so much of a stretch. I have no idea how accurate Nate Silver's interactive map is, but if it is correct, it shows Democrats with a much easier path to victory in 2016 than Republicans. 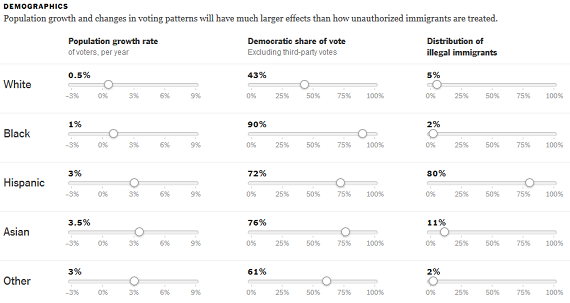 Side note: All other demographic vote distributions remaining the same as Nate Silver's settings, Democrat's share of the white vote would have to drop to 33% for the GOP to win. But even then, they only win 313-225, 49.4 - 48.7%. As noted above, Democrats have never won less than 35% of the white vote (at least not since exit polling began asking the question in 1984).